It’s late in the fourth quarter of the 2012 Pac-12 Championship Game. On the rain-soaked field, Stanford has the ball at its own 28-yard line with less than 5 minutes left in the game, desperately clinging to a three-point lead. An eager UCLA defense, with no more timeouts to spare, looks to get the ball back into the hands of Bruins quarterback Brett Hundley. It’s third-and-2. The Cardinal ran power — the bread and butter of the offense — on its last two plays, but on this third down, the team lines up in the shotgun formation. Sophomore quarterback Kevin Hogan takes the snap. He holds the ball in front of senior halfback Stepfan Taylor on the read option, but at the last moment, pulls it and darts to his right. A Bruins defensive end, thinking that the ball is surely going to the Cardinal’s workhorse running back, takes a wrong step to the inside. By the time he realizes his mistake, it’s too late. Hogan sprints ahead for 11 yards. First down, Stanford. The Cardinal would eventually fail to convert its next third down, but the run burned enough time off the clock to ensure that the Bruins could only muster a 52-yard field goal attempt in the final moments of the game. 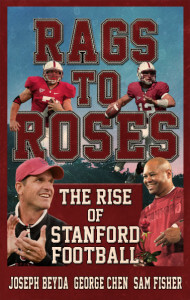 The kick hooked left, sending Stanford to the Rose Bowl. In the bigger picture, Hogan’s clutch run encapsulated how his mobility has added an extra — and important — dimension to the Cardinal offense and showed exactly why head coach David Shaw made the midseason quarterback change last year. Hogan saw only five starts under center last season, but all five games, most of which were played on the biggest stages in college football, ended in victories. The quarterback’s impressive resume — leading a fourth-quarter rally in his first collegiate start; taking down No. 1 Oregon in his first road game; winning Most Valuable Player in a conference championship game; becoming a Rose Bowl champion in the season finale — speaks for itself. But as the signal-caller prepares for the upcoming season, he faces a daunting challenge amidst already lofty expectations: improving the Cardinal’s passing game despite the departure of dependable targets, including tight ends Zach Ertz and Levine Toilolo and wideouts Drew Terrell and Jamal-Rashad Patterson, who accounted for 72 percent of the team’s receiving yardage last season. Hogan can’t afford to merely replicate his level of play from last season — not when opposing defensive coordinators will be better prepared the second time around; not when one small slip-up could ruin the Cardinal’s national title aspirations. Shaw, for one, will no longer be spoon-feeding his quarterback. Hogan will work with quarterbacks and wide receivers coach Mike Sanford, who guided Stepfan Taylor and the running backs the past two seasons, to improve his game. Considered to be one of the brightest young coaching minds in college football, Sanford promises that he will challenge Hogan more and more. Sanford understands the nuances of the quarterback position — he is, after all, a former Boise State passer. That’s not to say that Hogan wasn’t comfortable with the offense last year — in fact, the numbers show the opposite. With Hogan under center, the Cardinal was perfect in the red zone and converted 45 percent of its third downs; he also completed 71.7 percent of his passes, a vast improvement over the inefficiency of Josh Nunes that stymied Stanford’s offensive production during the first half of the season. Shaw also noted that Hogan consistently made the right checks at the line of scrimmage, reading opposing defenses with proficiency. Still, Hogan understands that there is no time to rest on his laurels. Even before the coaches began to challenge him, the quarterback took the initiative this summer by organizing captain’s practices, in which the players run plays on their own without the supervision of coaches. The quarterback focused on feeling more comfortable at the line and building a rapport with his young, but promising, receivers during the workouts. Just as importantly, Hogan’s willingness to lead those voluntary practices indicates that he is ready to take on a bigger leadership role this season. The time is ripe, especially with the departures of co-captains Taylor and center Sam Schwartzstein on offense. Though Shaw might not be thrilled with the occasional “goofing around,” he believes that the summer practices have paid off for Hogan. Backing up Hogan this season will be junior Evan Crower and sophomore Dallas Lloyd. Crower put up a great performance in the spring game, completing 26 of his 35 passes for 197 yards and two touchdowns as he commanded the second-team offense. Throughout spring ball, the 6-foot-5, 215-pound San Diego native impressed the coaching staffing with his accuracy. Lloyd, too, has been praised for his steady development. Before coming to the Farm, Lloyd went on a two-year mission trip to Chile, serving families in small villages near Viña del Mar. Two years away from the football field is tough for any player to overcome, something that Lloyd, who lost 15 pounds while on the trip, can certainly attest to. “I will never regret going,” said Lloyd, who was ranked as the 15th best high school quarterback in his class. “That’s the best decision I’ve made in my life — to go and to serve God and those people down in Chile. To focus on that for two years and then come back, it’s been hard. Physically and mentally, it’s been a great challenge. It definitely took me a while [to adjust]. Especially going into fall camp last year, I felt rusty. The coaching staff made use of Lloyd’s dual-threat capabilities last season by playing him on the scout team. The speedy sophomore’s responsibilities expanded during spring ball when he was utilized in triple-option packages, and they will carry over to the fall. Interestingly, Lloyd finds himself in a similar situation to Hogan’s a year ago as he faces the tough task of mastering Stanford’s voluminous playbook. 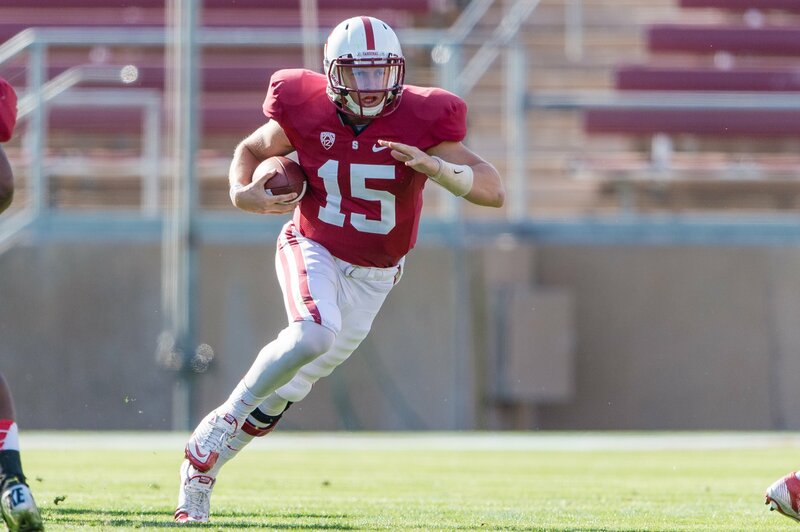 But even as Lloyd and Crower continue their development through camp, it’s clear that all eyes are on Kevin Hogan. After all, he is the only quarterback on the Stanford roster who has played in a collegiate game. “Naturally we look up to Kevin,” Lloyd added. 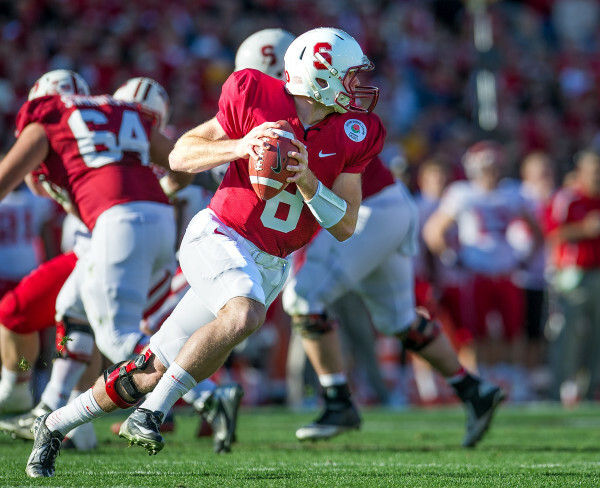 Less than a year ago, Kevin Hogan was talented, but inexperienced; athletic, but not mentally ready. No. 8 was a mere afterthought in the quarterback competition to replace Andrew Luck. But that chapter of his career is finished. In 2013, with his teammates looking up to him more than ever, Hogan will carry the heavy burden of national title hopes on his shoulders. Contact George Chen at gchen15 “at” stanford.edu. The Daily’s football preview series will be back Friday, as we take a look at Stanford’s tight ends. Want to learn about how Jim Harbaugh, confronted with a quarterback controversy, almost started Andrew Luck in 2008? Check out “Rags to Roses,” available in the Amazon Kindle store now! Stanford Daily football beat writers Joseph Beyda, George Chen and Sam Fisher interviewed 30 current and former players and coaches to bring you the story of the Cardinal’s resurgence from 2006 to 2012. You can also check out the free excerpts here.